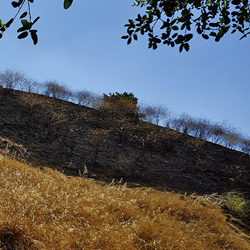 Help us plant this burned hillside in Hanns Park! Saturday, October 17 from 9:00 a.m. to noon at Upper Hanns Park: Several months ago, fire scorched a hillside in Hanns Park. Please join the Vallejo Watershed Alliance, in partnership with Visions of the Wild H20 and the Solano Resource Conservation District, to replant the burned area with native grasses and trees. We’ll meet in Upper Hanns Park. Park in the Wardlaw Dog Park lot, cross the bridge over the creek behind the dog park. Turn right, heading west down the path. You will see signs directing you to the restoration site. Wear comfortable clothes, sturdy shoes, hat, sunscreen, and gloves. We’ll bring water, refreshments, and tools.For more information or to RSVP, call (707) 654-1943 or email info@VallejoWatershedAlliance.org.